Who is Dr. Peter Wishnie? Dr. Peter Wishnie, podiatrist in Piscataway, NJ, was the second person to join Top Practices, so to say that he is familiar with Rem Jackson and everything Top Practices has to offer would be an understatement. He first met Rem seven years ago at a much smaller version of the annual Summit after being told to attend this high-energy goal-setting conference. At this point, Dr. Wishnie had already been doing his own goal setting for over 20 years, but, like most successful professionals, was willing to keep learning new ideas. He and Rem hit it off very quickly and by the end of that first meeting, Dr. Wishnie had told Rem that he would like to partner with him someday. Now, Dr. Wishnie is the Top Practices Practice Management Consultant and is in the trenches every day with business owners who have the same problems as many other professionals. He directs the Practice Management University calls and offers implementable solutions to many common management problems. What Will I Learn from Dr. Wishnie? At the Top Practices Marketing and Management Summit, Dr. Wishnie will be talking about organizing your office for success and beginning and advanced sessions on practice management – meaning that no matter what level you are at, there will be something for you to learn! He will also discuss how to get organized and how to run your practice efficiently without being there, and even making more money while you’re not in the office. Now, you might be thinking, “Running my practice without being there? That’s impossible!” This is not only possible, but it’s ESSENTIAL. Dr. Wishnie will show attendees how they can start making more money by working ON the practice instead of IN it. By attending the Summit, Dr. Wishnie knows that you’ll be leaving with an abundance of new ideas. Your notebook will be filled up with tremendous to-dos. Dr. Wishnie’s advice? Take away three things that you want to accomplish in the next 90 days. If you do them, and do them well, you’ll be well on your way to growing your practice in ways that you never would have dreamt. As a regular attendee of the annual Summit, Dr. Wishnie knows that attendees will leave with lots of energy, and not the kind that only lasts 24 hours. It’s an energy and excitement that you will take back with you to your practice to kick start and rejuvenate your staff in amazing ways. There are a lot of things to get excited about for this year’s Summit. Dr. Wishnie is particularly looking forward to the breakout sessions and workshops that will be directed by doctors and staff members who have the experience to guide you. The Marketing Directors Workshop, for example, will be a session in which you’ll learn the details of how these top podiatry offices in the country continue to attract and retain new patients. 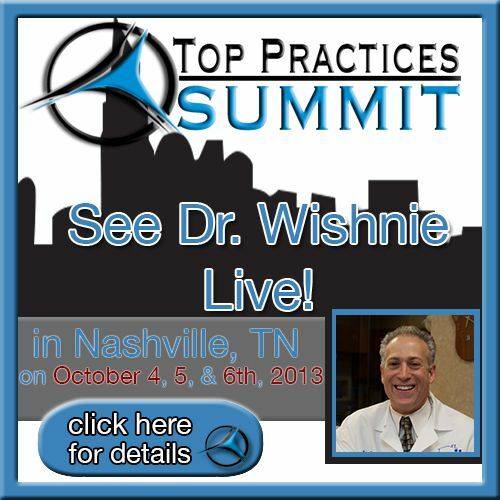 Attendees will have the chance to see Dr. Peter Wishnie speak live at the 7th Annual Top Practices Summit taking place at the Gaylord Opryland Hotel in Nashville, TN, October 4, 5, & 6. Now is the time to get registered for this exciting conference!